I received the Modern Spellcaster’s Tarot by Melanie Marquis and Scott Murphy way back in February. I’ve only just now opened them. Why the wait? Partially, it’s because they were a freebee from my publisher, along with a bunch of awesome books (at conferences, it’s often more cost effective for publishing houses to send sample copies home with attendees than it is to ship or fly materials back to some warehouse, hence my pile of booty), so I didn’t have the same kind of investment I normally would if I’d actually used my own money to purchase them. Further, I’m just not usually very impressed by mass published decks. There are absolutely some gems out there, but they tend to look the same to me after a while. But I started to feel bad about letting this poor deck languish in its packaging and finally opened it tonight. I’m happy to report that I’m genuinely impressed. I hadn’t read any publisher descriptions or reviews at this point, but was struck immediately by the obvious attempt at inclusivity in the artwork. There are people of color on several cards in every suit as well as in the Major Arcana, and effort has also been made to include relationship models beyond the usual heteronormative depictions in the classic Waite-Smith (two men in the Two of Cups, for example). Low and behold, the Modern Spellcaster’s Tarot is billed as “inclusive” and “multicultural.” There have been some really awesome self-published tarot projects in the last couple of years working to represent queer and POC communities (offhand I’m thinking of the Slow Holler Tarot and the Slutist Tarot), and it’s good to see mainstream releases following suit (haha see what I did there), however slowly. I need to pause for a second and go on about these Knights, though. The Knights are some of my favorite cards, and I love what’s happening with their mounts. The Knight of Cups—on his bigass fish—is easily the most delightful tarot image I’ve seen all year. These guys are just such…dudes. Take away their horses and give them giant squirrels and suddenly they’re a thousand times more relatable (in my world, oversized forest beasts = relatable). I do wish the cardstock was thicker. I could see myself actually using this deck to read for myself, but I’m pretty sure a couple of months in heavy rotation would be all that these cards could take. Otherwise, though, this deck is one of those gems I mentioned earlier. This entry was posted in Deck Showcase and tagged tarot, tarot deck, tarot decks, tarot reading on August 3, 2017 by thornthewitch. Have you ever signed up for something and then not finished? Or maybe just haven’t been able to work at the rate you’d prefer? I’m still working through the Correspondence Course through Tarot School. I’m a little over halfway, which feels like a huge accomplishment given how much I’ve done since I first signed up (earned a graduate degree, got a teaching license, got my own classroom, wrote my first book). My teacher, Wald Amberstone, tells me that hardly anyone actually finishes. Plenty of people sign up, but most of those don’t make it beyond the first lesson. I’m guessing that it’s because it’s a lot more work than people expect, and much of that work is tedious. Right away, you learn exercises for contemplating cards at many levels, but then you actually have to write these contemplations out for literally every card in the deck. I enjoy these sorts of tasks, but even I find it to be really challenging. 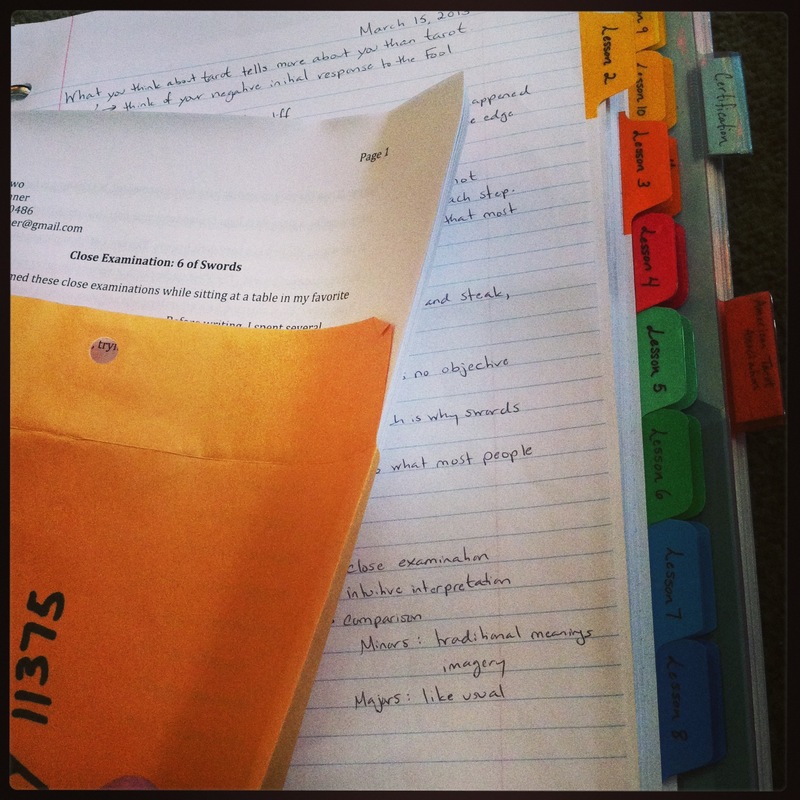 It takes me forever to finish individual lessons, just because of how much writing each entails. I always learn a ton, though, so the work has been well worth it. Increasingly, my practice of tarot has almost nothing to do with divination. I still think divination can be valuable, but for me it has a very definite time and place, and that only rolls around once in a great while. Further, sometimes I just don’t want to know things. I’d rather suss things out gradually, tracing the strands in my own journaling and discerning patterns. Without that kind of context, drawing cards can feel starkly off the mark. Only later do we go, “Oh, hey, that’s what that card was about.” By then the information is less useful. We just add the experience to our mental bank and hope to be a bit more astute next time. I also think there’s a danger in becoming overly dependent on things like daily draws. As meditative exercises, yes, absolutely. But I’ve seen a lot of people get so hung up on what they pull each morning that they give up some of their own agency, resigning themselves to “what the cards said” or making far-fetched connections that, while perhaps valid, don’t actually depend on having a daily divination ritual. Sure, the 9 of Swords could be about your laundry, but did you really need a deck of cards for that? I’ve never left that liminal space where tarot is both sacred (a map of the universe), but also totally mundane and accessible (laundry). I’m sure it’s something I’ll always wrestle with. My next project is reviving and reformatting the newsletter. I’ve been writing a lot lately (most recently at Patheos) about identity, and I really want to consolidate some of my web presence. I do a lot, and it’s gotten hard to keep up with the various versions of myself. And if you’d like to keep up with me and my assorted adventures, you’ll be able to do so in one place (more or less)! Meanwhile, I’m doing all of the things that go along with publishing a book, after the manuscript is done. Turns out there’s a lot! The release date for Traditional Wicca: A Seeker’s Guide (with Llewellyn) is still almost a year away, but there’s still a ton of work to do. I should see my cover in the next few days, though, and I’ll be sure to share it with you all! This entry was posted in Personal and tagged correspondence course, tarot on July 19, 2017 by thornthewitch. Well, autumn is almost over and you haven’t heard much from me these past few months. I knew this season would be rough, and I’m grateful to see it come to a close. I’ve been teaching at the university, teaching at the elementary school, taking my own classes (finishing up the teaching license), teaching the periodic class at Laughingbrook, preparing for the American Academy of Religion’s annual meeting, conducting tarot readings, writing for Patheos, running a coven, writing and performing a wedding (in another state! ), serving on the board of my archery club, and trying to remember to feed Oliver periodically. 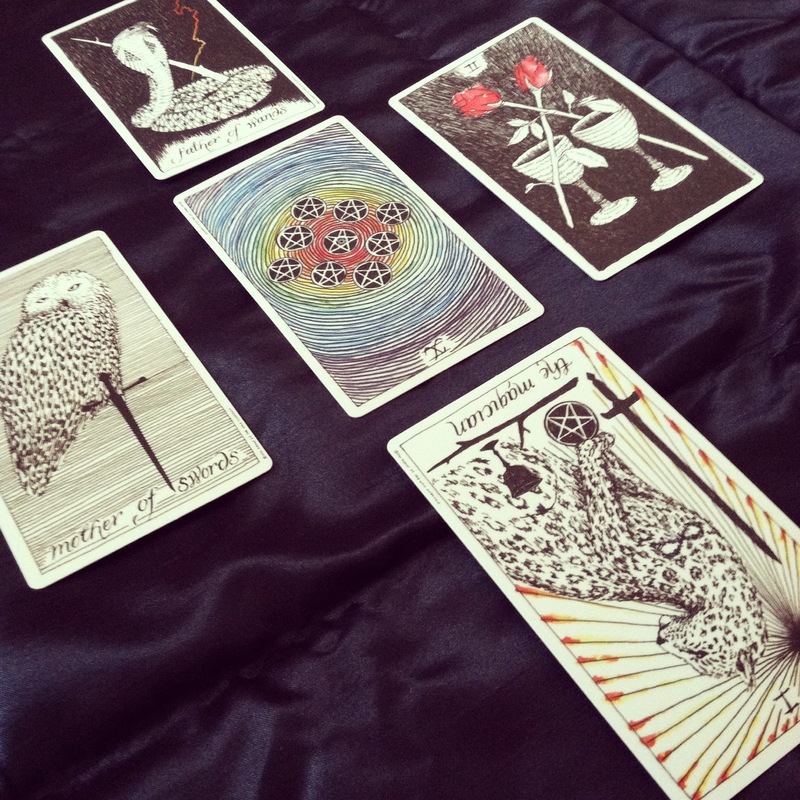 Many, many things have sadly fallen by the wayside, and I’m afraid the tarot blogging was one of them. But not to fear! I’m still carrying on with the meat of the thing. The shop is still open for readings, I still teach tarot locally, and I’m still plodding through my own tarot studies, if at a much slower pace than I’d prefer (seriously, I’ve been on this Qabalah project for almost a year). I’ve also got about a half dozen amazing decks that I want to showcase here (The Ghetto Tarot! COSMOS Tarot and Oracle! Plus some upcoming Kickstarters that I’m ridiculously excited about). I wish I had more time, but lately I just don’t (though I promise I’ll get to those showcase posts, even if it’s just pictures). It’s discouraging having to pick and choose what to practice (I use that word consciously and broadly…everything we seek to improve upon requires “practice”). I love doing a lot of things, and it’s oftentimes frustrating to feel like I don’t have one niche the way other people seem to. In order to really excel at anything, you have to practice consistently, whether that means playing your instrument every day, regular target practice, consistently writing, or devoting your focused energies to building a business. But if I played guitar, shot my bow, threw my axe, ran, wrote, and studied tarot every day, I wouldn’t have time left to go to work, see my friends, or run my coven. Oliver would never have anyone to play with him. Chaos would ensue. I’ve met people who are geniuses. I went to music school with one kid whose ear was downright scary. I know people with IQs that make me look like I’ve suffered a recent head injury. I’ve got a covenmate who makes every piece of art I’ve ever created look like drunken fingerpainting at one of those wine-and-paint chains. I know incredible athletes whose every movement makes me feel like I’m back in middle school gym, losing at dodgeball. I’m not a genius, not a master. I’m a Jack-of-all-trades, and I think that’s okay. Originally—so I’ve read and choose to believe—the term wasn’t derogatory. In some instances, the full phrase is actually, “Jack of all trades, master of none, but oftentimes better than a master of one,” and that’s my favorite version. What looks like fickleness or lacking commitment is actually versatility, so long as I’m still improving and still being mindful when I do practice. I’ll never be a rock star, a champion archer, or someone who can make her entire living working with tarot, but I can be constantly improving and achieving satisfaction through doing what I can do and doing it well. Tarot is one of those things that’s been with me for years and years, and I know it always will be. I can build slowly, improve on things one by one, and I’ll still see results down the road. There’s no need to beat myself up for not having time to read every book, or not having the cash or energy to take every class. I think it also makes performing readings more special for me. Burn out is a real thing, it turns out, and when I cut myself some slack I find that my output is of a higher quality. So I’m still around and you’ll still hear from me here! I’ve got lots in the works and plenty of big plans for the future. But I’m not going to stress over it. In the meantime, you can still visit me on Facebook (and like my page! ), read my thoughts on witchcraft over at Patheos, and follow me on Twitter. This entry was posted in Uncategorized on November 26, 2015 by thornthewitch. 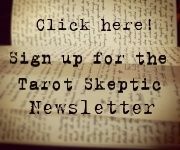 This entry was posted in Personal, Practical Tarot and tagged correspondence course, course review, tarot, tarot certification, tarot course, tarot school, wald amberstone on July 16, 2015 by thornthewitch.